The Hook: Paul Rudd, and, well, isn’t everybody watching it? I have to say, I was ambivalent about this one. I kind of wanted to watch it and at the same time considered let this one go. And then I heard Paul Rudd was going to be Ant-Man. I like Paul Rudd. I haven’t seen him around as much and I was intrigued to see how he played the whole Ant-Man thing. And I thought, well, what the hey. I’ve watched most, if not all of the Marvel franchise may as well catch this one. And, you know, I’m glad I did. I enjoyed it more than I excepted. 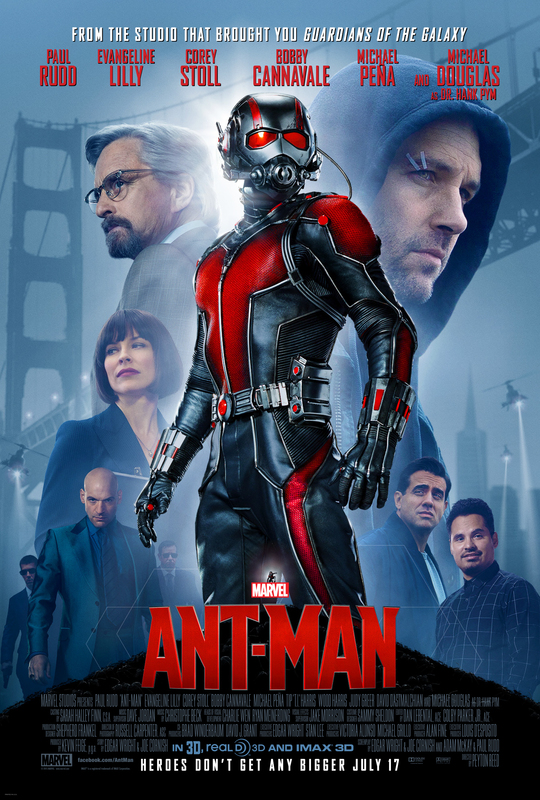 The story follows Scott Lang who is a thief. He’s pretty good at it too. So, he gets this job that is supposed to be an epic score. He gets to the house, thwarts all these crazy security safeguards, and gets up against this heavy duty vault. It’s old school tech and he takes a moment to figure out how he’s going to get through this one. And he does! After all, he has some kind of science-y background. I can’t remember what exactly (and I’m bugged that I can’t quite remember! Ah well, that just means I gotta watch it again ) but that’s why he ends up in prison. His employer was doing something that wasn’t on the up and up and Lang hacked the system which landed him in jail. Ok, so he breaks the vault door and discovers this suit. He puts it on. The fun begins. Especially when finds out the job was actually some kind test and–you guessed it–nailed it. So, as I mentioned, pleasantly surprised. I didn’t know what to expect going in. Marvel hasn’t really disappointed me with all the box office hits they’ve been having and while I’m not part of the comic book fandom I enjoyed this story line. Who doesn’t like a hacktivist (except those on the receiving end of course)? Who doesn’t like to see the comeback of a guy who’s been knocked down? I know I do. And this movie did a pretty good job at keeping the story interesting and moving along. And you gottah love the actors. Paul Rudd is always fun to watch, at least the movies I’ve seen with him. Michael Douglas is another one who is fun to watch and hardly ever disappoints. And Evangeline Lily is quickly becoming someone to follow. She’s doing well for herself and not that she needs my approval or whatever, but I’m glad to see her hard work paying off. I mean, acting alongside Michael Douglas? A giant in the industry. Corey Stoll and Bobby Cannavale added the right amount of tension creating a story that flowed pretty good. Cinematography was pretty awesome! It was fun to watch and I was excited to see the dynamics between small-to-large and vice versa. I didn’t get dizzy so that’s a plus. I have to say, though, the editors, along with the director et al, did a really good job getting it all to work while keeping things as close to reality as science fiction can get. It’s movie that should be on your to-watch list, especially if you’re following this franchise. It’s worth the two hours. I’d definitely add it to my library. YES! Thank you! I knew he had a degree in something. My mind is at peace now, lol.